I just LOVE it when Fall comes! Today felt like Fall...60 degrees and just beautiful. This really is my time of year. HALLOWEEN APPROACHES!!! 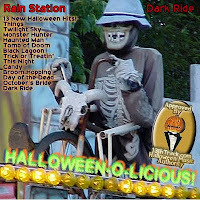 I'm very happy to annouce that Rain Station's DARK RIDE CD is NOW available on iTunes! Click here to check it out! It has been a long time comin' and I'm just so dang happy it is there (for some reason). So, I need ya'll to do me a favor. IF you have an iTunes account (and if you've heard and LIKED the CD) please log on and REVIEW the disc. It isn't hard to find - just search for Rain Station and you'll find two of our CDs - Stonedozer and DARK RIDE. My hope is to HYPE the heck out of the CD so perhaps iTunes will put us on their front page and maybe even ask us if they can put one or more of our tracks on an iTunes compilation. Jay and I would appreciate it if you would review the CD. Well, that's it for tonight...we're closing in on October and I will once again attempt to blog every day.